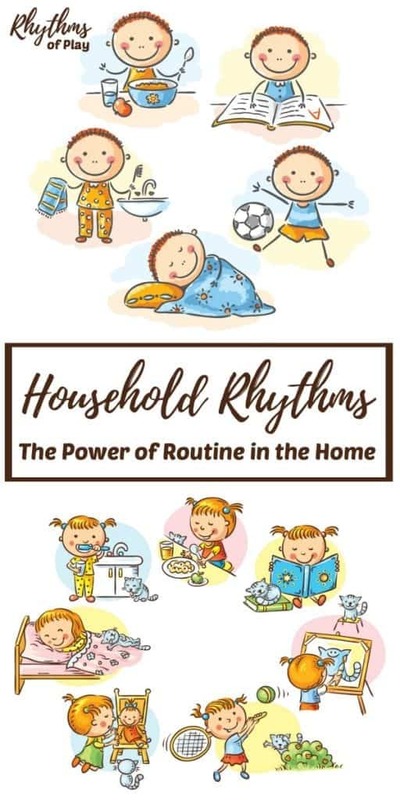 Household rhythms consist of all the activities and routines that each member of the family performs every day, week, month, season, or year. Establishing consistent household routines can help you care for your children, manage your household, and get things done. Find out how below! What are Household Routines and Rhythms? Children thrive when consistent routines are followed in the home. Establishing household rhythms is also an invaluable tool for increasing your productivity so you can have more free time to play and enjoy life. The more consistent household rhythms become the better home life will be. In other words, establishing consistent household rhythms can help you care for your children, manage your household, and get things done! A daily rhythm consists of the activities or routines that are repeated every day. This includes meal times, sleep times, work times, and daily or weekly chores. These rhythms will, of course, vary person to person and household to household. Daddy’s day may be entirely different from the rest of the household, but there will most likely be overlap in the mornings and/or evenings. The more consistent these individual and family rhythms become, the more efficiently your household will run. To learn how to create a daily routine and weekly rhythm click on the link! Weekly rhythms consist of the activities or routines that you do consistently throughout the week. This could be activities such as swimming on Tuesday’s, play dates on Wednesdays, and park days on Thursdays. The colors of the day found in the Waldorf tradition is another example of a weekly rhythm or routine that can be implemented in the home. Once I tried it, I was sold on rhythm in the home. It helped me stay focused on day-to-day tasks and weekly chores as a home daycare provider. When daily and weekly rhythms are established children begin to learn the pattern and no longer need you to direct every single moment of every single day. For parents, teachers, and caregivers this spells FREEDOM! Your monthly rhythms consist of the activities that you perform regularly every month. Monthly classes, cleaning chores, jobs, and household & personal reviews usually fall into this category. Examples include working on the household budget, completing goal reviews, or attending a monthly meeting. Your household rhythms may look different than mine, but there will always be cycles of things you do regularly. Increase your productivity by making the space for these routines and rhythms at regular times each month. I have personally found incorporating seasonal elements and celebrations into my family’s rhythms provides meaning and brings a sense of connection to our lives. Seasonal rhythms are the activities we do seasonally such as go swimming in the summer and snowboarding in the winter. Seasonal rhythms also consist of things you do in and around your home during the different seasons of the year such as planting flowers in the spring and raking leaves in the fall. Another example would be using a nature table that changes to reflect the seasons. More examples of seasonal rhythms and routines can be found in the seasonal bucket list activity guides below. Yearly household rhythms consist of the activities that you do every year — taxes anyone? How about making those easier by writing down your daily and/or weekly expenses, and doing a monthly budget review? These are all household rhythms you can establish to make your life easier to live. It will free up your time and help you feel a lot less stressed around tax season, I guarantee it! It will also help you become more aware of your finances so you can get out of debt. Sound to daunting of a task? I assure you it’s not. Just use the power of habit to help you succeed. Learn how in using the power of habit to change your life. Yearly rhythms are also found in holidays and other celebrations and family traditions that occur once a year. Some people consider spring cleaning a yearly rhythm and I would agree. Our family cleans and de-clutters our whole house every spring making it one of our yearly rhythms. Establishing household rhythms does not mean that you have to include all of them right away… that’s crazy making! Start slowly, add one new routine or habit at a time to build on a solid foundation. 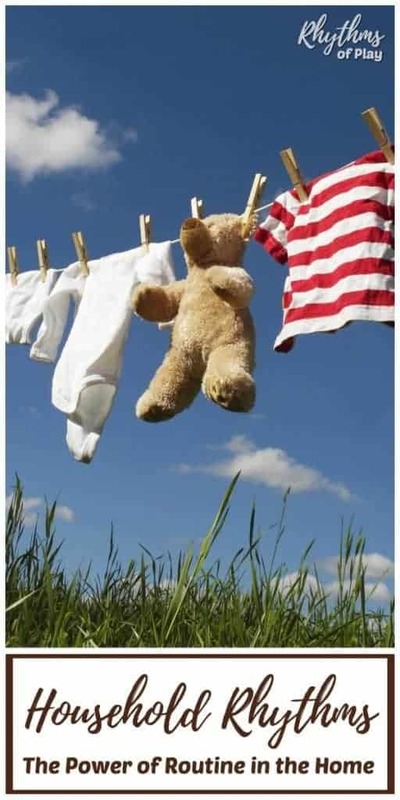 The more consistent household rhythms become the better home life will be — this is especially true for young children. In my family, we have found that following daily and weekly rhythms help keep everything together, even when life falls apart. Establishing household rhythms is also an invaluable tool for increasing your productivity so you can have more free time to play, enjoy life, do the things you love, and even a few things you never thought you could. Making household rhythms and routines consistent will give you the time and space to get things done and the freedom to live the life of your dreams. Children thrive when consistent routines are followed in the home. When daily and weekly rhythms are established children begin to learn the pattern and no longer need you to direct every single moment of every single day. For parents, teachers, and caregivers this spells FREEDOM! Establishing household routines and rhythms is also an invaluable tool for increasing your productivity so you can have more free time to play and enjoy life. The more consistent household routines become, the better home life will be. Establish a daily rhythm to harness the power of routine in your household today! Getting into a daily/weekly rhythm is definitely something I need to work on more. Unfortunately, with the pain issues I have this is difficult, but I think if I devoted enough energy to it and pushed through on the hard days it would be so helpful to the whole family! I’m sorry to hear that you are in pain Alyssa 🙁 I would have to agree that creating a strong rhythm as a foundation for you and your family would help support you through even the worst of days. Give it a try.